In the summertime we tend to have parties and celebrations to go to every weekend, whether they be graduation parties, summer BBQs, 4th of July bashes etc. Here are three crostini recipes that are full of fresh, bright flavors, colors and textures. If you bring any of these to your next get-together, your friends and family will think you paid a high-end caterer to make them..they look and taste that impressive! The best part is they are pretty darn easy! Remove and discard the stem and natural "string" from each Sugar Snap Pea Pod. Set aside. Fill a large bowl of water with ice and water and set aside. Bring a large pot of heavily salted water to a boil and then drop the Sugar Snap Peas in the water. Boil them in the water for 2 minutes only and then using a slotted spoon remove them from the water and place them in the bowl of ice water to shock them. This helps them retain their color and crunch and cooks them ever so slightly. Once they are cooled in the ice water remove them and dry them off on paper towels (set aside in fridge for garnish). Do the same thing with the shucked Fava Beans but for about 3-4 minutes or until tender. Drain and shock in the ice water then remove the outer skin gently. Try not to break up the beans you want them to hold their beautiful shape. In a food processor, blend together the Fava Beans, Mint Leaves, Lemon Juice, Garlic, about 2 Tablespoons of Extra Virgin Olive Oil and a dash of Salt and Pepper. You want everything to combine and become a soft, creamy, thick spread. If it is too thick add more OIive Oil and a drop more Lemon Juice. Put in a small bowl or tupperware and squeeze a little lemon juice over the top, cover tightly and place in the fridge until you are ready to use it. Tip: If you are gluten free or don't want the carbs you can each this like a dip with sliced raw veggies! Slice your baguette thin on a bias, drizzle them with olive oil, salt and pepper and place them on a cookie sheet. Place them in the oven on 400F and toast them up until they are golden. You want them to get crunchy but not so hard that they turn to stone. When you are ready to serve your guests, assemble your crostini by spreading about a teaspoon of ricotta on each slice of bread, then spread a little Fava Bean spread, then a few shavings of parmesan cheese (or manchego) and then top it with the Sugar Snap Pea. Finish them with a tiny drizzle of Extra Virgin Olive Oil and a sprinkle of sea salt (or regular salt if you have no sea salt). Mix the diced tomatoes, some chopped tarragon and a little minced garlic in a bowl. Drizzle some extra virgin olive soil over the top along with some salt and pepper. I didn't put amount here because it depends on how much you are making and it depends on taste! Jus taste and season accordingly. If you like a lot of garlic then put more, if not then just put a drop. Let the tomatoes marinate covered in the fridge for at least a half an hour or overnight if you are prepping ahead. When you are almost ready to serve, slice the fresh mozzarella into thin slices that fit perfectly onto each slice of toasted bread. Place one slice of mozzarella on each piece of bread and then top with a heaping spoonful of the marinated tomatoes. Finish with a drizzle of balsamic or balsamic reduction if you would like (I like to use the fig balsamic that is discussed in the next recipe below). Slice the figs into 1/4 inch slices starting at the top by the stem. Place the figs in a small bowl and pour the balsamic vinegar over the top so that they are soaking in the vinegar. Cover and place in the fridge for at least 3 hours or overnight. I even like to do this step 2 or 3 days in advance because the figs really marinate in the vinegar and also end up infusing the vinegar which is great for drizzling over your crostini or on your salad. Slice your baguette thin on a bias, drizzle them with olive oil, salt and pepper and place them on a cookie sheet. Place them in the oven on 400F and toast them up until they are golden. You want them to get crunchy but not so hard that they turn to stone. Leave the oven on. When you are almost ready to serve, slice the Havarti cheese into thin slices that fit perfectly onto each slice of toasted bread. Place a slice of cheese onto each piece of bread and then put them on a sheet pan and place them back in the oven just until the cheese melts. Take them out of the oven and sprinkle each one with a little of the fresh chopped sage. 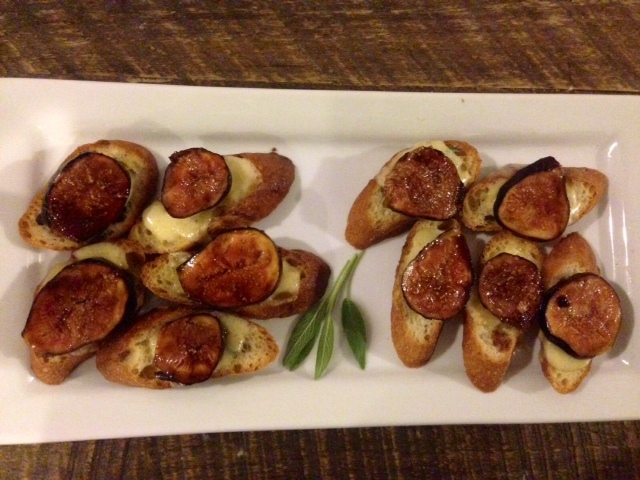 Place one slice of marinated fig onto each crostini and drizzle each one with a little more of the fig infused balsamic. Sprinkle with salt and pepper and you are ready to serve! We are in the final days of Spring and sailing right into summertime which to me means sunshine, the beach, relaxing in the park and...the BEST fruits and vegetables are in season! This salad is the perfect addition to your summer BBQ or dinner party menu. It is light, refreshing, crisp and very unique in flavor and appearance. It is unique in that it doesn't have your typical ingredients like Romaine, Arugula or Iceberg. It uses three things that are in season right now and they are Fava Beans, Watercress and Sugar Snap Peas. 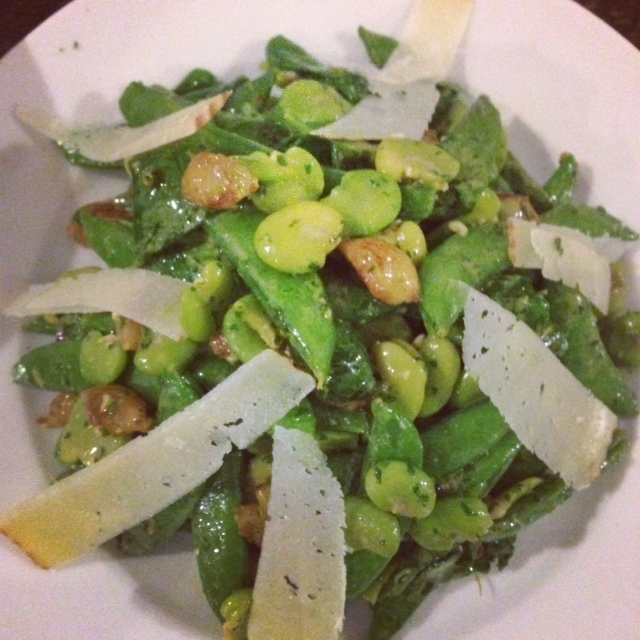 Fava beans are not a common ingredient for most households but they should be! They are beautiful to look at and have a creamy, but crisp texture and almost a cheesy, earthy flavor that goes perfect with my mint vinaigrette and the Manchego cheese. 1/3 Cup Pearl Onions (frozen and thawed)- You can use fresh as well but make sure you cook them through. First prepare the dressing by blending the Mint, Dijon, Lemon Juice, Garlic, Honey, a dash of salt and pepper and a drizzle of both olive oil and canola oil (using a blend of oils prevents the dressing from being too bitter) in a food processor or blender. Add more oil a little at a time until it reaches the consistency of a vinaigrette or lite dressing Add more salt and pepper if needed. Seal in a container and set aside in the fridge to let the flavors meld together. Fill a large bowl of water with ice and water and set aside. Bring a large pot of heavily salted water to a boil and then drop the Sugar Snap Peas in the water. Boil them in the water for 2 minutes only and then using a slotted spoon remove them from the water and place them in the bowl of ice water to shock them. This helps them retain their color and crunch and cooks them ever so slightly. Once they are cooled in the ice water remove them and dry them off on paper towels (set aside). In a small frying pan, place the peeled pearl onions and sprinkle them with a little white sugar. Cook on medium heat rolling them around and coating them with the sugar until the onions caramelize/brown and they are cooked and heated through. Set aside. Toss the Fava Beans together in a large bowl with the Snap Peas, pearl onions and the cleaned Watercress. Dress the Salad with a little vinaigrette at a time, making sure you coat each pea and bean evenly but do not over dress. Spoon the salad onto a serving dish and then take a few shavings of the Manchego Cheese and lay it on top as shown in my photo. You can also just shave the cheese and toss it with the salad! Using a mandolin or sharp knife, slice the zucchini in very thin rounds. The mandolin is a great tool because it takes about 1 minute to slice the whole zucchini, and it slices it paper thin, which is what you want. Next, pour equal parts of canola oil and extra virgin olive oil in a large frying pan until the oil completely coats the bottom of the pan. You want about 1/8 inch-1/4 inch of oil in the pan. Heat the oil on medium heat until it gets hot enough where it sizzles and little when you put in a piece of zucchini. The key to this is you want the zucchini to brown and cook evenly. Once the oil is hot. Place a single layer of zucchini flat around the pan in the oil. Let it cook until it gets golden brown and then flip each piece with tongs or a fork and cook on the other side until it browns. Once It's brown and cooked on both sides, using a slotted spoon or tongs take the zucchini out and place it onto paper towels to drain some oil out. Sprinkle them with a little salt and pepper while they are hot so it sticks. Repeat the frying process until all the zucchini is cooked. In between each batch add more oil if you need to or it will burn. Once all the zucchini is fried wipe out the excess oil and grease felt the pan. Add a little more clean olive oil to the pan just about a tablespoon or so just to cost the pan and place it on medium heat. Pour all the browned zucchini back into the pan And spread it out evenly. Pour the beaten eggs over the top of the zucchini and let it sit a few seconds. When you see the eggs are starting to cook use a wooden spoon and stir the mixture all around as if you were making scrambled eggs and let the eggs cook and meld with the zucchini. Once the eggs are cooked and everything is blended together, pour the zucchini and eggs into a bowls and add a little more salt and pepper to taste. You can now eat it as is or put it on some nice warm, toasty Italian bread. I know it's almost summer and the temperature is rising, but no matter what time of year, who doesn't love a nice bowl of homemade chicken soup! When I am sick, stressed or just in need of some TLC, chicken soup always delivers! It just nurtures the body and soul from the inside out! Growing up my mom made homemade chicken soup pretty often, but she always put her own spin on. The base of the soup is traditional, but we add some spinach leaves and beaten egg into the soup to give it an amazing egg drop soup consistency to it as well. I add some leeks to the mirepoix because they have such a rich, wonderful flavor to them that is less harsh then a traditional onion. This is one of those one pot meals that you can throw together, set on the stove, get some chores done and then sit down to enjoy it..no fuss! Drizzle 1-2 Tablespoons of Olive Oil into a large pot and heat on medium low. Drop in the chopped leek, Vidalia (or white) onion, bay leaves and Red Pepper Flakes and sweat for about 5 minutes to release the flavors. Add the chopped Carrots, Celery and minced Garlic and stir to combine. Cook on medium low heat about 5-7 minutes or until the flavors come together. Add a dash of Salt and Pepper and the whole sprigs of thyme. Place the whole chicken in the pot and pour in the chicken stock. Sprinkle the chicken bouillon into the 4 cups of hot water and stir to dissolve. Pour the water/bouillon mixture into the pot with the chicken and vegetables. Bring the mixture to a boil and then cover and simmer on medium low heat for an hour and a half. After roughly 90 minutes, remove the chicken from the pot and shred I using tongs or your fingers. Be careful it will be hot!! Place all the shredded chicken meat back into the pot with the soup and discard the bones. Remove the Thyme sprigs and Bay leaves from the soup and discard. Add the spinach leaves and parsley to the soup and stir until the leaves wilt. Take the two beaten eggs and while whisking or making a beating motion with a fork in the soup, carefully pour in the raw beaten eggs into the soup. You want the soup to have a slight fogginess but not have huge chunks of scrambled egg, that is why it is important for the liquid to be moving (by the motion of a whisk or fork) while pouring in the egg. Let the soup simmer for about 5 more minutes then serve! If you want to have noodles or pasta in the soup, keep them separate and scoop a little pasta into each persons bowl. Keeping the pasta separate is important because if you put it in the soup it will absorb all the liquid. Scoop some pasta into each persons bowl, pour in some soup, grate some fresh Parmesan cheese over top and enjoy! Theyre just too pretty and too healthy to be called Deviled Eggs! People ask me all the time how I come up with my recipes and my honest answer is I dream about them! Sometimes I have food daydreams that are so detailed and so vivid that I am starting to feel like I am a food psychic, if that even makes sense. This recipe came to me in one of those daydreams. In my dream I started picturing these beautiful red deviled eggs, which got me wondering how they got red in the first place. I wanted the eggs to become red in a natural way so I thought of two of my favorite ingredients, beets and pomegranates. Both have the natural ability to dye foods a vibrant color (and also your hands so watch out), and are also full of nutrients. The beets give the egg yolk mixture a wonderful earthly flavor as well as some moisture which makes it creamy with no fattening mayo added. The juicy pomegranate seeds burst in your mouth when you bite into the eggs, cutting through the richness and giving the eggs a fresh finish. These are the perfect edition to your Memorial Day or summer time BBQ! Using a sharp knife, slice the eggs in half lengthwise. Scoop out the yolks gently so you don’t break apart the whites of the egg, and place the hard-boiled yolks into the bowl of a food processor or blender. Set the egg whites aside on a plate. Blend together the egg yolks, Dijon, shallot, honey, beets, vinegar and salt and pepper until creamy. If the mixture is too thick add a few drops of the reserved beet juice until you reach the desired consistency and texture. You want it thick, but still very creamy. Evenly scoop heaping teaspoons of the egg/beet mixture into the egg white halves. Garnish with some parsley and about 3-4 pomegranate seeds per egg half. Spring: In like a lion and out like a lamb burger? April is here which means warmer weather, rain showers, budding trees, my favorite Cadbury chocolate eggs and of course Easter! Many families like to celebrate Easter with a big ol’ honey baked ham or a delicious leg of lamb. To celebrate the start of Spring I created a lamb burger that has such dynamic flavors and textures that you might even make these babies the Easter dinner headliner. Don’t like lamb? No problem! Make this recipe using good old fashioned beef chuck burgers! But...wow…the grassy flavor of the lamb combined with the tangy, creamy goat cheese, the crisp, lemony fennel and mint slaw, and the smoky and sweet bacon tomato jam are culinary chemistry: flavors that interact with each other perfectly in your mouth. This recipe is BAAAHHHDDD AS$...ok that was cheesy. Tip: Make extra bacon jam and use it on gourmet grilled cheese sandwiches, make little crostini hors d’oeuvres with the jam and gouda or Havarti cheese, put it on turkey club sandwiches or even savory scones! The fennel salad is even great as just a side dish or as a substitute for boring old coleslaw that is full of fattening mayo! Cook the bacon in a deep skillet or medium saucepan until it is crispy and brown. Using a slotted spoon remove the bacon, drain it on paper towels and set it aside. Reserve about 1 ½ Tablespoons of the bacon fat in the pan. Put the pan with the bacon fat on low-medium heat on the stove. Add the onion, tomatoes, brown sugar, vinegar, salt and pepper. Bring to a boil stirring often. Add the bacon back to the pan with the tomato mixture. Simmer stirring with a wooden spoon pretty frequently (making sure it doesn’t burn) until it starts to thicken and the onions get soft and caramelized. You will cook it for about 30- 40 minutes or until most of the water evaporates and you are left with a thick jammy texture. Put in mason jars or a bowl and refrigerate. Using a knife or a mandolin, shave or thinly slice the fennel into 1/8 inch slices starting from the bottom of the bulb. Do not use the green, “hair” or “fronds”at the top of the fennel bulb. Fennel has this great anise flavor and its texture is like celery meets an onion. In a small bowl whisk together the olive oil, lemon juice, honey, whole grain mustard, salt, pepper and shallot. Toss the fresh mint with the fennel in a big bowl. Toss the fennel with the dressing and then cover the bowl with plastic wrap and let it sit in the fridge for at least an hour or overnight so the fennel can really marinate in the flavors. Preheat your outdoor barbeque, indoor grill pan or George Forman Grill. Using your hands, mix together the ground meat with the garlic and oregano. Make 4 equal sized burger patties that are about ¾ to 1 inch thick. Sprinkle both sides with salt and pepper. Grill the burgers for above 5-6 minutes on each side or until they are just slightly pink inside (or however you like them!) While the burgers are grilling, spread a little butter on the inside of the burger buns and place them on the grill as well. Get the buns nice and toasty on all sides. Spread about 1 Tablespoon (or more ;) ) of the Bacon Tomato Jam on the inside of each bun half. When the burgers are cooked, place the burgers on the jam coated buns and top each one with about 1 ounce of goat cheese. Top the goat cheese with a nice little mound of the Fennel Mint Slaw and place the top of the bun on top. When it is bitter cold outside you need a hot, comforting meal that will warm you up from head to toe. Growing up, stews and pot roasts were my mom’s go-to dinners on those snowy days when you are stuck inside and have some time to kill. What’s great about pot roast and stew is that there is very little prep work. Besides a little chopping, you pretty much just toss all your ingredients in a pot, stick it in the oven and let it cook in its juices until it is perfectly tender. My pot roast recipe is a compilation of a few of my favorite stew and pot roast recipes with a unique twist. The oils from the orange peel add so much flavor and depth to this dish by giving the carrots and celery this wonderful, sweet and tangy glaze. The hint of citrus compliments the red wine beautifully and brings some acid to the dish which helps to tenderize the meat. My secret ingredient, cocoa powder, adds a rich flavor to the dish and comes together with the tomato paste perfectly just like your favorite Mexican Mole` sauce. Slow cooking the chuck roast in a covered pot with all the juices causes the meat to become so moist and tender that it melts in your mouth. The seasonings and herbs in this dish have very festive flavors which are perfect for Christmas or New Year’s dinner. Forget the boring old turkey; this is the perfect holiday meal! Preheat the oven 350 degrees F.
Coat a Dutch oven or any large oven safe pot with olive oil and bring to medium-high heat. Sprinkle the chuck roast generously with salt and pepper on both sides, add it to the Dutch oven and brown it on all sides. Remove from the pan and set aside. Add a few drops of new oil and add the celery, carrots onions and crushed red pepper to the pan. Season the vegetables with salt and cook until they are slightly soft about 10 minutes. Add the garlic and cook for 1 to 2 minutes. Add the tomato paste and cocoa powder and stir until combined. Pour in the vinegar and wine and stir to combine and cook for 2 to 3 minutes. Stir in 3 cups of chicken stock. Taste and adjust the seasoning if needed. Toss in the bay leaves, orange zest, and thyme. Return the meat to the pan, cover and put the Dutch oven in the oven for 1 hour. Remove the pan from the oven, turn the meat over and check the liquid level. If the liquid level has gone down, add about a half a cup of stock. Return the pan to the oven and cook for another hour. Gently flip the meat over again, cover and cook for another 30 minutes. Remove the lid to the pan and roast until the liquid is reduced, another 15 to 20 minutes. Remove the pan from the oven. Remove the meat from the pan and skim off any excess fat from the surface of the cooking liquid, if need be. Serve with the meat with the cooked veggies and pan juices over some creamy mashed potatoes. Like many Americans, I have a serious addiction to peanut butter! It is thick, nutty, earthy, sweet, creamy, sometimes crunchy and always delicious. I eat peanut butter on bread with jelly or Nutella, put a spoonful of it in my oatmeal, blend some with yogurt and fruit in a smoothie, make cakes and cookies with it, even eat it plain on a spoon while watching TV, and oh yeah…I put it on chicken wings. You may be thinking oh my, this girl has lost her marbles, but oh you are so wrong. The creamy texture and nutty, semi-sweet flavors of the natural peanut butter combined with the spicy, tangy and slightly acidic hot sauce is nothing short of perfection. I bread my wings in Panko crumbs to give them the perfect amount of crunch when you bite into them. The Panko breadcrumbs get nice and golden brown in color and make the wings look spectacular. If you serve these babies at your next Super Bowl party or as an appetizer for an upcoming dinner party during the holidays, trust me you will be the talk of the party. Have you recently tried one of my recipes? Share your feedback with me in the comments section below each recipe or tweet me @gotroomformore. Instagram me a picture of your Got Room For More dish! In a medium pot pour in the olive oil, shallot and garlic and sauté until translucent. Pour in the Hot Sauce and stir until combined. Whisk in the brown sugar, natural peanut butter, Worcestershire sauce, soy sauce, and lime juice. Cook on low heat until all the flavors come together. Add salt and pepper to taste but be careful it may be salty enough. Set aside and allow the flavors to meld together off the heat while you cook the chicken. Preheat your oven on convection setting on 400F (or 425F on Bake setting). Sprinkle the wings with a nice dusting of all the spices. There is no real measurement for this, just give it a nice coating. Place the wings on a wire rack sprayed with non-stick cooking spray and then place the rack on a sheet pan to catch the drippings. Line the pan with foil to reduce your mess. Bake for about 20 minutes then remove from the oven and lightly baste each wing with a little bit of sauce. Place them back in the oven for another 5-7 minutes or until they are fully cooked and golden brown. Toss them in the remaining sauce and serve! Heat the peanut oil in a deep pot until it reaches about 360F or when you drop a piece of breadcrumb in the oil it bubbles up and turns golden brown. While the oil is heating, beat a few eggs in a shallow dish. In a separate dish pour in your Panko, a couple dashes of cayenne pepper, black pepper and salt. Mix together so the spices are evenly distributed. Dip the chicken wings and drumsticks into the beaten egg and then roll them in the panko crumbs so they are fully coated. Drop 4 to 5 pieces of chicken (if they are small) into the hot oil at a time. Allow the chicken pieces to get nice and brown and crispy in the hot oil and cook all the way through. This will take about 8-10 minutes for small wings and drumettes and 12-14 for large drums. Remove the cooked pieces of chicken from the oil with a slotted spoon and place them on paper towels to soak up the excess oil. Do not put in too many at a time or they wont get brown or cook properly. If you are making a lot of wings you can keep them warm in a 200F oven on a cookie sheet. Toss the wings in my peanut butter wing sauce and enjoy!! The cold weather just seems to hit you like a ton of bricks each November. One day its 70 degrees and then the next day you’re in a puffy coat, boots and gloves! My Coconut Turkey Chili will warm you up from head to toe and will leave you feeling satisfied without all the calories and fat of normal beef chili. The flavors are Thai and Mexican inspired, due to the addition of the coconut milk, lime and chili powder. Serve this to your guests at your next football viewing party or even as a unique starter course for Thanksgiving dinner! In a large saucepan, sauté the onion, garlic, bell pepper and bay leaves. Once the onion is translucent and soft add the turkey meat. Using a wooden spoon break up the turkey meat in the pot and allow it to cook through and brown slightly. Add the chicken stock, coconut milk, kidney beans, chickpeas, chili powder, white pepper and the juice of half a lime. Allow the soup to simmer and all the flavors to come together. Cook on medium low heat until the chili thickens to your desired texture. Stir in the fresh parsley. Ladle into serving bowls and sprinkle a generous amount of Mexican shredded cheese on top. Dollop with sour cream, squeeze a little fresh lime over the top and enjoy!! Split the squash in half vertically and scrape out the seeds. Line a cookie sheet or roasting pan with aluminum foil. Season the inside flesh of the spaghetti squash with olive oil, salt, and pepper. Place flesh side down and roast for about 45 minutes until fully cooked (until you can stick a fork in it easily). Remove from the oven and let rest until cool enough to handle. Meanwhile heat the marinara sauce in a medium size pot. When squash is cool enough to handle, using a fork, scrape the strands of squash from the inside of the skin into a bowl. Pour the hot tomato sauce over the squash. Sprinkle with Parmesan cheese. Serve the squash by itself, or with a piece of grilled or broiled fish or chicken. ENJOY! The picture above is another delicious way to make Spaghetti Squash! All you do is sauté some shallots and garlic in olive oil, throw in some chopped Portobello mushrooms, frozen peas and a touch of chicken stock and simmer until the vegetables are soft. Toss the mixture with the spaghetti squash, salt and pepper and some grated Parmegiano Reggiano and you have another delicious “faux pasta” dish! I’ve said it before, but there is nothing like a meal full of pumpkin and sweet and savory spices in the month of October. As the temperature starts to drop and we start to retrieve our coats and scarves from storage, there’s nothing more comforting than a hot bowl of soup. Since Halloween is quickly approaching, and you’re going to need a festive food to eat while you watch Hocus Pocus (I know you love it), I have developed the perfect Pumpkin Soup recipe for you. It’s my own “witches brew” full of aromatic spices and rich, pungent flavors. A creative and impressive way to serve this soup at your Halloween party or even Thanksgiving dinner, is to hallow out small pumpkins, ladle in the soup and have your guests eat right out of the pumpkins! Heat a medium saucepan on medium heat. When the pot is hot put the chopped bacon in the pot. Allow the bacon fat to render and for the bacon to brown and get crispy. Using a slotted spoon, remove the bacon and set it aside (use it as garnish later). Leave the fat in the pot. Add the butter to the pot on medium-low heat. When the butter melts add the chopped onions, whole bay leaf and garlic and sauté until soft and translucent. Add the chicken stock, pumpkin puree and sage leaves. Bring it to a simmer, stirring periodically. While the mixture is simmering, place the chopped apple in a microwavable dish and microwave it on high for 3-5 minutes or until soft and mushy. Add the cooked apple, brown sugar, cinnamon, nutmeg, ginger, maple syrup, salt and pepper to the pot with the pumpkin mixture. Allow to simmer with the lid on for 10-15 minutes to bring the flavors together. Remove from the heat and using an immersion hand blender or a regular blender, blend the soup until it is silky and smooth. Pour the mixture back into the pot. Add the milk to the pumpkin mixture and simmer for another 5-10 minutes or so. Remove from the heat and serve! I heat up some olive oil in a pan on high heat and then fry up some sage leaves in it. The sage gets crispy like a chip and acts as a great garnish on top of the soup. You can also put a dollop of crème fraiche or sour cream and a drizzle of honey, or even some toasted pumpkin seeds! The opportunities are endless. One of my favorite culinary tips is “cross utilization!” If you have leftover ingredients such as chicken, potatoes, rice, tomato sauce, you name it, you can create a whole new meal in the blink of an eye! When I made my delicious Chicken Cacciatore (see recipe below) I used my leftover tomato sauce as a main ingredient in the dish and then served the chicken with some Quinoa. I had a hefty portion of Quinoa leftover so instead of tossing it in the trash I used it to make a whole new creation! This dish can be made as sort of a "California style" savory brunch dish or as a healthy dinner! The Quinoa cakes are packed with nutrients and zesty Mexican flavors, and the salsa and lime cream on top bring some moisture and freshness to the dish. If you are a vegetarian (or even a carnivore like me) this is the dish for you! I told you healthy food does not need to be boring food! In a medium bowl break up the kidney beans slightly with a fork. Add the rest of the ingredients and mix together using your hands or a fork to make sure everything is evenly combined. Heat up the Olive Oil in a skillet on medium heat. When the oil gets hot, form pancake like circles of the Quinoa mixture on the pan. Mine were about 4 inches in diameter. When the cakes are nice and golden brown on the bottom, gently flip with a spatula. Cook on the 2nd side until it is golden brown and the inside of the pancake is cooked and no longer sticky inside. Top with the Avocado Tomato Salsa and a Dollop of Lime Cream. Stir together the diced Tomato, Avocado and Parsley or Cilantro. Squeeze some fresh lime juice over the top, along with a drizzle of olive oil, and tiny drizzle of honey. Season with salt and pepper. Toss everything together and serve on the Quinoa Cakes, on fish, tacos, chicken or whatever you like! Squeeze the juice of the lime into the yogurt, stir and dollop on top of the Quinoa Cakes, or even tacos, quesadillas and more! As an Italian woman, I love to make extremely large pots of homemade tomato sauce which I ultimately freeze because I can’t possibly serve it all in one evening. Tomato sauce freezes beautifully and can be used in a multitude of ways…not just on pastas! I used some of my leftover tomato sauce to make this delicious, simple Chicken Cacciatore. The chicken slowly braises in the juices causing it to fall off the bone and have a rich, savory flavor. I start the dish when I get home from work, set it in the oven, do some chores or work out and then come back to it an hour later. In a ceramic pot (Dutch oven) or any oven safe pot, heat up the Olive Oil on the stove on medium high heat. Sprinkle the Lemon Herb Seasoning (or Lemon Pepper) on the Chicken Thighs. When the oil gets very hot, put the chicken in the pot skin side down. You want the skin to have a nice brown sear on it. Sear the chicken on both sides. You don’t want to cook the chicken all the way through, you just want to lock in the juices by browning it. Remove the chicken from the pot and set aside. Throw the Onions and Garlic into the pot and sauté until they start to soften up. Pour in the red wine and let it cook for about 2-3 minutes. Put the chicken back into the pot and pour the tomato sauce and chicken stock over the top. Put the leaves of the Thyme sprigs into the pot along with the Cumin Seeds, Capers, Salt & Pepper and Peas. Cover the Pot with the lid and place the pot in the oven. Allow the chicken to cook for about 45 minutes-1 hour and then remove the lid and allow the juices to reduce until the sauce is thick. Enjoy with rice, mashed potatoes, quinoa or something that can absorb some of the juices. Last year, I was lucky enough to visit my boyfriend in Germany while he was studying abroad. We visited some of most unbelievable cities like Berlin, Munich, Freiberg and Bonn. The infrastructure of each city was entirely unique, but they were all equally beautiful and interesting. Another major commonality between these cities was their love for sausages and beer. I have never tried so many different types of sausages in my life! You’ve got your Nürnberger Rostbratwurst, your Knackwurst, Currywurst, Bierwurst, Blood Sausage…the list goes on and on! In honor of their tasty cuisine and their famed Fall festival, Oktoberfest (which started yesterday in Munich), I have created a delicious Fall recipe that incorporates both beer (or should I say bier) and sausages. I slow cook the sausages in a sweet and savory mixture that includes apples, apple cider, sage, onions, sauerkraut, and of course beer. I don’t use just any kind of beer, I use Pumpkin Ale! Every Fall season you can find dozens and dozens of different Pumpkin Ales lining the shelves of your favorite beer distributer. I used Blue Point’s Pumpkin Ale because it has such delicious, aromatic spices in it which really compliment the apple cider…oh and it’s from Long Island, and we all know that only good things come from Long Island (wink wink). I served my sausages with homemade potato and cheese Perogies and a tall glass of the Pumpkin Ale to bring out the flavor in the dish. “Anderen Helfen Bitte! !” “Another Helping Please!” is what you’ll be shouting! 1 Cup of Pumpkin Ale (I used Blue Point Pumpkin) You can use any dark beer but I like the pumpkin because it has such wonderful fall spices in it. In a Dutch Oven ceramic pot (I use a le cruset) or any oven safe pot, cook the chopped bacon over medium heat until the fat renders (melts) and the bacon starts to get crispy. Add the butter to the pot and allow it to melt. Add the onion, sage leaves and garlic to the pot and cook on medium-low heat until the onions start to soften and caramelize slightly in the butter. Add the apple chunks and cook for about 5 minutes to bring the flavors together. Pour the onion mixture into a bowl and set aside. Leave all the drippings in the pot and place on medium heat. Sear the sausages on each side in the pot to give them some color and to lock in the juices. Remove the sausages from the pot and set aside. Deglaze the pot by pouring in the beer and the apple cider while the pot is on medium-low heat. The liquid will bubble up nicely. Using a wooden spoon scrape up all the nice bits that are at the bottom of the pan from when you cooked the bacon and onions. Add the onion and apple mixture back into the pot along with the sauerkraut and mustard, and stir until combined. Add about ½ teaspoon of salt and about ½ teaspoon of pepper to the pot. Add the sausages back to the pot and cover the pot with a lid. Place the pot in the oven and cook covered for about 45 minutes to 1 ½ hours or until the apples are soft and the sausages are cooked through. Then remove the lid and cook for another 10-20 minutes or until the liquid reduces and reaches your preferred consistency. I like for the liquid to reduce down a substantial amount so you are left with a less soupy consistency. Although the sausages are cooked after 20-30 minutes, when you allow them to cook in the juices in a covered pot for an hour- an hour and a half, they become tender, buttery and full of flavor! Add more salt and pepper to taste and some extra finely chopped sage for color and flavor (optional). Serve with mashed potatoes, or my favorite, potato and cheese perogies. Serve with mashed potatoes or my favorite, potato and cheese perogies. The following article/recipe was created for my friends over at Happily Ever Borrowed. Happily Ever Borrowed is "the premiere online wedding shop that rents designer bridal accessories worldwide at a fraction of the retail price!" I will be sharing some of my favorite recipes with their wonderful followers on the HEB Blog. This recipe is a must try! Take a look! Imagine that you are days away from tying the knot. Most married couples will tell you that the days leading up to your wedding can be the most exciting and the most stressful. The anticipation and the anxiety can be overwhelming as all the final details and loose ends are being tied together. All the while, the prospective bride is trying to count calories, worried that her dress may not fit! You and your fiancé need to plan a nice “wedding- plan-free” evening together so that you can take the time to enjoy each other’s company and focus on what’s really important: the joining of two hearts in the name of love! In my opinion, there’s nothing better than sharing a delicious home cooked meal with your lovey while getting comfy on the couch and watching your favorite flick. How about the first movie you ever saw together? This will help you to reconnect by bringing back those memories of the nervous butterflies you had in your stomach, the giddiness, and the excitement of a new relationship. 1 Heaping Tablespoon of Chipotle Adobo Sauce (Buy the can of Goya Chipotle Peppers in Adobo Sauce and use the sauce the peppers are in. You can also cut up one of the peppers to add the the meatloaf if you like things very spicy. Cook the Quinoa by bringing the Quinoa and about ½ of water to a boil. Allow to simmer stirring occasional until it is tender and expands a little. (About 15 minutes) Put the cooked Quinoa in the fridge to cool. While the Quinoa is cooling in the fridge, heat up the olive oil in a small pan on low heat and add the garlic and onions. Cook down the onions and garlic until they soften and start to become translucent. Remove the onions from the stove and stir in the Worcestershire, Adobo Sauce, Fresh Thyme, Salt, and Ketchup. Set aside and allow to cool down. In a medium bowl mix together the ground turkey, cooled quinoa and egg . It is best to use your hands so the egg is fully incorporated. In a small bowl stir together the glaze ingredients: Brown Sugar, Adobo, Ketchup (add a drop of water if it’s too thick). Set aside. Cover a small loaf pan (Best to use a mini ceramic loaf pan around 5 inches by 3 inches) in aluminum foil and spray it with nonstick cooking spray. Scoop the turkey mixture into the loaf pan and spoon the glaze over the top covering the top of the meatloaf completely. Bake the Meatloaf in a water bath to keep it moist inside while it bakes. This means you will place the loaf pan in another oven safe shallow dish that is slightly larger than the meatloaf pan. Fill the dish with a little hot water so it’s about 1/3 of the way up the side of the loaf pan. Bake for 50-60 minutes or until the center of the meatloaf feels firm to the touch and the ground turkey is fully cooked. For the last 15 minutes of the cooking process remove the meatloaf from the water bath and finish cooking it in the oven without the water bath. (If you have a meat thermometer, stick it in the center and when it reaches 160F it is cooked). Remove the meatloaf from the oven and let it sit for about 15 minutes. The meatloaf will hold its shape better if you allow it to cool slightly. Gently pull the foil up out of the pan releasing the meatloaf. Using a spatula or tongs place the loaf on a serving dish. Slice it up and serve with your favorite sides! I love this meatloaf with mashed potatoes and a nice crisp cucumber or green salad. Check out my recipe for Tangy Cucumber Salad, it is perfect next to this dish. This recipe is in honor of my best friend Chris and my sister’s wonderful boyfriend Mel. Both gentlemen are of Lebanese descent and have introduced me to some traditional Lebanese dishes that were unforgettable. Of course there is lamb, hummus, falafel etc. but one of my favorite Lebanese specialties is Tabbouleh. Tabbouleh is a Middle Eastern dish that may have started as far back as 4,000 years ago when the Arabs started utilizing grains like Bulgar Wheat. There are many ways to make Tabbouleh and many ways to spell it! Some recipes utilize much more parsley than Bulgar wheat and others predominantly consist of wheat and use the parsley as more of a flavoring agent. I love parsley, but I find it can be slightly tough in texture, so I prefer the wheat to be the star of the dish. My version is crunchy, creamy, nutritious and extremely refreshing. Pair it with a grilled piece of fish, lamb or chicken and you have the perfect healthy/hearty meal. There are many health benefits to eating this dish…so much that it is known as one of the healthiest salads or sides you can eat! 8.8 ounces of Bulgar wheat (I use the bag of Trader Joes 10 Minute Bulgar Wheat that is partially cooked)- Cook it according to the directions and cool in the fridge. I boil mine in part water and part chicken stock to give it more flavor. Using a sharp knife, carefully slice the corn kernels off the cob. Put all the uncooked kernels in a bowl and toss them with about 1-2 Tablespoons of Olive Oil and a dash of salt and pepper. Spread the corn out evenly on a cookie sheet lined with parchment paper or aluminum foil sprayed with nonstick cooking spray. Roast the corn in the preheated oven for 10 minutes or so, or until it is tender and starts to brown slightly. Set the corn aside when it is done. In a large bowl stir together the cooked and cooled bulgar wheat, diced cucumbers, tomatoes, scallions, onion, parsley and corn. Set aside. In a small bowl whisk together the olive oil, lemon juice, salt, pepper, mustard powder and honey. Pour the oil mixture over the wheat mixture a little at the time, while tossing it with a fork. Once the ingredients are all evenly blended together, set it in the fridge to cool. You can eat it at room temperature, but I prefer to eat it chilled. You should make it several hour in advance or even a day in advance so all the flavors can macerate. Serve with your favorite protein. I enjoy mine with a nice piece of grilled fish, chicken or beef. I am incredibly passionate about this dish because it is one of the most unique pasta dishes you will ever taste! It brings back so many wonderful memories of friends coming over for sleepovers and play dates and my mom in the kitchen prepping this pasta for us to enjoy. Even though this dish is full of carrots and peas (which tend to be a kids worst nightmare), my friends used to BEG my mom to makes this dish when they came for dinner, even back in elementary school! This dish has such a beautiful, creamy and crunchy texture, and a very rustic, earthy flavor. Most people taste this dish and say they have never tasted anything quite like it. Another great thing about this dish, is it tastes great even 3, 4, 5 days later! Just throw it in a Tupperware, pop it in the fridge and it enjoy it the next day for lunch! This is the perfect dish to make in September and October when we are transitioning from Summer to Fall. In a pan, toast the breadcrumbs in 2 Tablespoons of olive oil on medium heat. Be sure to stir them around occasionally so they don’t burn. You want them to get golden and crunchy. Set them aside in a bowl. In a large skillet, sauté the shallots and minced Garlic in the remaining 1 Tablespoon of Olive Oil until they are soft and translucent. Add the Peas and Chicken Stock and simmer for about 3-4 minutes. Stir in the Carrots and cook at a simmer until the carrots are tender. Stir in the Cream and Salt and Pepper (to taste). Simmer the mixture until it reduces about one fourth. Set sauce aside and keep it warm while you cook the pasta. Boil a large pot of water (add some salt to the water) and cook the pasta until al dente. Drain the pasta and toss it with the sauce, about ½ of the breadcrumbs and the fresh mint. Divide the pasta into pasta bowls and finish the dish with a sprinkle of the extra breadcrumbs on top and some fresh grated Parmigiano Reggiano. I believe that the simplest of dishes are often the most memorable and the most satisfying. This pasta dish verifies my theory! Stuffed pastas, like ravioli, Fiochetti, and Agnolotti have so many wonderful flavors within them, that it is best to top them with a very basic sauce. Basic sauces like butter based sauces, enhance the flavors of the pasta, rather than overshadow them. Two of my favorite places to shop in NYC are Eataly (23rd st and 5th ave) and Agata & Valentina (81st and 1st ave). Both of these specialty markets carry the finest and freshest Italian ingredients. You can buy everything from artisanal cheeses, to homemade pastas and breads, delicious pastries and even the most beautiful cuts of meat and fish. When I am standing on the check-out line, there is a 99% chance I will have Goat Cheese Agnolotti in my basket at Eataly, and Pear and Cheese Fiochetti in my basket at Agata & Valentina. Agnolotti are miniature raviolis stuffed with a creamy, rich goat cheese filling, and Fiochetti (sometimes called Pasta Purses in the US) are small bundles of pasta filled with cheese (and sometimes fruit or mushrooms). I prefer the Pear and Cheese Fiochetti because they use the perfect blend of cheeses combined with sweet pears to give it a pop of freshness. I make a simple White Wine Butter Sauce with fresh Marjoram or fresh Sage to compliment the flavors of the pasta. Make this for a friend or a significant other and I promise they will never let you go! While you are waiting for the water to boil start making the sauce. In a medium nonstick frying pan, melt the butter and add the olive oil to the butter. Sautee the garlic until it starts to get fragrant. You do not want the garlic to turn dark brown or the sauce will have a bitter taste! Keep it on low heat. Add the cream and stir until combined. Add White Wine and fresh Marjoram or Sage and Let the sauce simmer until the alcohol burns off and the sauce thickens. If you would like your sauce thicker, you can make a “faux roux” I call it. To do this you take one Tablespoon of butter and knead about 1 Tablespoon of flour into it as if the butter were dough. Whisk the butter into the sauce and within a minute or two the sauce will start to thicken. When the water is boiling, drop the fresh pasta in the pot. Fresh pastas like agnolotti and fiochetti cook very fast! Once they float to the top that means they are good to go! Cut one open and make sure the inside is warm and you are all set! Using a slotted spoon, remove the pasta from the water and place it right in the pan with the sauce. Gently toss the pasta around in the sauce and then grate fresh Parmigiano Reggiano over the top. For an extra garnish, sprinkle on some fresh Marjoram or Sage! Enjoy! I love to pair some of my richer and meatier entrees with very light, fresh sides . I want my side dishes to compliment the key component of the dish rather than overshadow it, and that is exactly what this salad does. My crispy, vinegary Cucumber Salad tingles the taste buds like a fresh pickle from your favorite deli. The pleasantly acidic flavors seem to cleanse your palate as you enjoy your meal. As an added plus, there are barely any calories in this dish! In a medium bowl stir together the Cucumbers, Red Onion and Dill. In a separate small bowl, whisk together the Vinegar, Dijon, and Honey. Pour the dressing over the cucumber mixture and toss to coat each cucumber. Cover and place in the refrigerator for at least an hour (or overnight) to allow the cucumbers to marinate and pick up the wonderful flavors of the dressing. Okay, the secret is out! I am about to share one of my all-time favorite family recipes with you…Eggplant Caponata. Caponata is a cooked vegetable mixture consisting of eggplant, celery, olives, capers, sweetened vinegar and spices. Caponata is traditionally eaten before the meal as an appetizer or antipasto as we say it in Italia. Caponata originates from Sicily and showcases some of the most common flavors found in that region. This July, I was fortunate enough to spend 10 days in Sicily with my family. Along with octopus salads, pasta with sardines and pizza we must have tried 6 or 7 different Caponata recipes. Although each one was uniquely delicious, my favorite one is still my Grandmas! Enjoy this with crackers or sliced Italian bread beside Italian meat and cheeses, or even do as my father does and mix it together with some canned tuna for a delicious healthy lunch! Click on the photo to see more pictures of the dish! In a large pot or Saute the eggplant, onions, garlic, celery and red pepper flakes in the olive oil on medium-low heat. Add more olive oil if you feel its too dry and the vegetables are not sauteing. Cover the pot, and stir occasionally until the vegetables start to get soft. Add the tomato paste, oregano, red wine vinegar, capers, olives and sugar. Stir and allow the mixture to cook down for at least 15 minutes. If the mixture is way too thick add a little bit of water. I did not need to add any but it depends on your preference. You want the mixture to cook down and all the flavors to come together. Remove from the heat and serve it hot as an appetizer beside Italian bread (or crackers) and cheeses, or serve cold…its great any way you like! You can even mix it with pasta or with canned tuna.